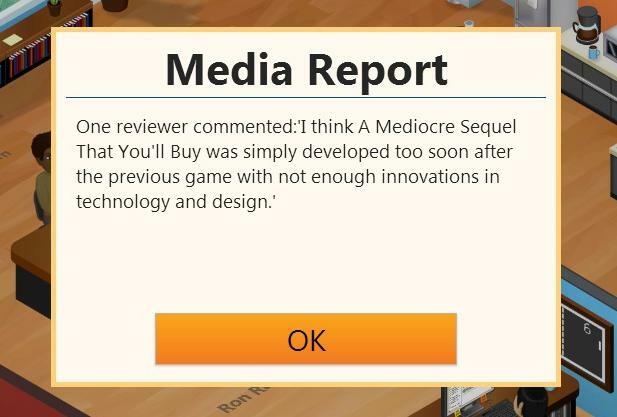 Can I just say how much I am absolutely in LOVE with Game Dev Tycoon? The games only been out for only maybe a few weeks tops and I am absolutely addicted to it. Constantly trying new combinations of style and genre, laughing at the fun being poked at actual real world gaming events (The Xbox One-80, Nintendo dropping the CD expansion for the SNES only to have it become the Playstation, the PS3 launch price and over bloated ego about the demand, etc), and then just trying to create the most awesome game possible. I’m still not sure how much the name of the game factors into the success. My girlfriend has had great success with “Another Stupid Baby Game” but “A Mediocre Sequel That You Will Buy” didn’t sell as well (Shocker. Truly.) However, the game actually called me out on using the default title “Game #34” saying that the game was as uninspired as the title. So uh… maybe it does pay attention? So far my most successful ventures have been PC Fantasy RPGs (Griffon Age: Beginnings, Griffon Age II: Freedom Flies), PC Alternate History RPGs (Clock Punk: The Battle for Neo London, and my smash hit MMO Clock Punk Multiverse – yes, you CAN make an MMO. And expansions. You can also make Steam.) and PC Cyberpunk RPGs (Dirk Spaceman Zero: Dirkness Rises – a prequel to my failed Space Action Dirk Spaceman series). Game Dev Tycoon is available on Steam as part of the Greenlight Games for $9.99. I recommend it as a great escape and fun side game to just kill time with. Just be careful. I sank 6 hours – SIX – into this game my first night with it and didn’t even realize. Posted on September 5, 2013, in Gaming and tagged game dev tycoon, greenlight game, review, rewview, silly names, steam. Bookmark the permalink. Leave a comment.